Companies must adjust their basic prices to account for differences in customers and situations. 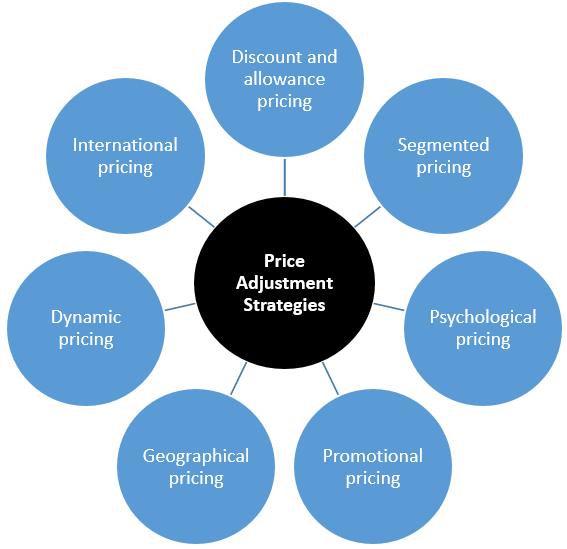 There are seven price adjustment strategies: Discount and allowance pricing, segmented pricing, psychological pricing, promotional pricing, geographical pricing, dynamic pricing and international pricing. Let’s examine the most important price adjustment strategies! The first one of the price adjustment strategies is applied in a large share of businesses. Especially in B2B, this price adjustment strategy is rather common. Most companies adjust their basic price to reward customers for certain responses, such as the early payment of bills, volume purchases and off-season buying. Discount and allowance pricing can take many forms: Discounts can be granted as a cash discount, a price reduction to buyers who pay their bills promptly. Typical payment terms look like this: “2/10, net 30”, meaning that payment is due within 30 days, but the buyer can deduct 2 per cent if the bill is paid within 10 days. Also, a quantity discount can be given, which is a price reduction to buyers who buy large volumes. A seasonal account is a third form of discount, being a price reduction to buyers who buy merchandise or services out of season. Allowances refer to another type of reduction from the list price. For instance, trade-in allowances are price reductions given for turning in an old item when buying a new one. Especially in the car industry, trade-in allowances are very common. Promotional allowances refer to payments or price reductions to reward dealers for participating in advertising and sales support programmes. Often, companies adjust their basic prices to allow for differences in customers, products and locations. In short: adjusting prices to account for different segments. In segmented pricing, the company thus sells a product or service at different prices in different segments, even though the price-difference is not based on differences in costs. Several different forms of segmented pricing exist. Under customer-segment pricing, different customers pay different prices for the same product or service. For instance, museums and theatres may charge a lower admission for students and senior citizens. Under product-form pricing, different versions of the product are priced differently, although the difference is not due to cost differences. To give an example, look at a bottle of Evian mineral water. It may sell for €1 at the local supermarket. But if you buy a 150ml aerosol can of Evian Brumisateur Water Spray, you will pay more than €8 in beauty boutiques and spas. The content, though, is the same, only in a different product form. Under location-based pricing, a firm charges different prices for different locations, although the cost of offering each location is the same. For instance, in the USA, state universities charge higher tuition fees for out-of-state students, and theatres vary their seat prices because of audience preferences for certain locations. Finally, under time-based pricing, the firm varies its price by the season, the month, the day or even the hour. This is commonly applied in the hotel business. Of course, several conditions must be met for this price adjustment strategy to work. The market must be segmentable, and segments must show different degrees of demand. In addition, the cost of segmenting and reaching the single parts of the market cannot exceed the extra revenue obtained from the price differences created. It is most important that segmented prices reflect real differences in customers’ perceived value. Another one of the price adjustment strategies is psychological pricing. It refers to pricing that considers the psychology of prices, not simply the economics. Indeed, the price says something about the product. For instance, many consumers use price to judge quality. A €100 bottle of perfume may contain only €3 worth of scent, but people will be willing to pay the €100 because the high price indicates that the product is something special. However, this does not work forever. When consumers can judge the quality of a product by examining it or by calling on past experience with it, price is less used to judge quality. But when they cannot judge quality, price becomes an important signal. Just to give an example: who is the better lawyer? One who charges €50 per hour or one who charges €500? It would need a lot of research and experience to answer this question objectively. Most of us would simply assume that the higher-priced lawyer is the better one. In fact, for most purchases, consumers simply do not have all the skill or information they need to work out whether they are paying a good price. Often, time, ability or inclination to research different brands or stores, compare prices and get the best deals is lacking. Therefore, psychological pricing may be the most powerful one of the price adjustment strategies. Promotion pricing calls for temporarily pricing products below the list price, and sometimes even below cost, to increase short-run sales. Thus, companies try to create buying excitement and urgency. Promotional pricing could take the form of discounts from normal prices to increase sales and reduce inventories. Also, special-event pricing in certain seasons to draw more customers could be used. Even low-interest financing, longer warranties or free maintenance are parts of promotional pricing. However, promotional pricing can have adverse effects. If it is used too frequently and copied by competitors, price promotions can create customers who wait until brands go on sale before buying them. Or the brand’s value and credibility can be reduced in the eyes of customers. The danger is in using price promotions as a quick fix in difficult times instead of sweating through the difficult process of developing effective longer-term strategies for building the brand. For that reason, price adjustment strategies such as promotional pricing must be treated with care. The next one of the price adjustment strategies is geographical pricing. In geographical pricing, the company sets prices for customers located in different parts of the country or world. Should the company risk losing the business of more-distant customers by charging them higher prices to cover the additional shipping costs? Or should the same prices be charged regardless of location? FOB-origin pricing: goods are placed free on board a carrier, the customer thus pays the freight from the factory to the destination. Price differences are the consequence. Uniform-delivered pricing: the company charges the same price plus freight to all customers, regardless of their location. Thus, there are no geographical price differences. Zone pricing: the company sets up two or more zones. All customer within a zone pay the same total price, the more distant the zone, the higher the price. Base-point pricing: the seller designates some city as a base point and charges all customers the freight cost from that city to the customer. This can level the geographical price differences if a central base-point is selected. Freight-absorption pricing: the seller absorbs all or part of the freight charges to get the desired business. Price differences are thus eliminated. Dynamic pricing refers to adjusting prices continually to meet the characteristics and needs of individual customers and situations. If you look back in history, prices were normally set by negotiation between buyers and sellers. Thus, prices were adjusted to the specific customer or situation. Exactly at that point, dynamic pricing starts. Instead of using fixed prices, prices are adjusted on a day-by-day or even hour-by-hour basis, taking many variables into account, such as current demand, inventories and costs. In addition, consumers can negotiate prices at online auction sites such as eBay. As you can see, dynamic pricing is one of the price adjustment strategies that has developed rapidly in recent years and becomes more and more common. The last one of the major price adjustment strategies is international pricing. Companies that market their products internationally must decide what prices to charge in the different countries in which they operate. The price that a company should charge in a country can depend on many factors, involving economic conditions, competitive situations, laws and regulations, and the development of the wholesaling and retailing system. In addition, consumer perceptions and preferences may vary from country to country, calling for differences in prices. Also, the company might have different marketing objectives in different markets, which require changes in pricing strategy. Without doubt, costs play an important role in setting international prices. Higher costs of selling in another country, which is the additional costs of operations, product modifications, shipping and insurance, import tariffs and taxes, and even exchange-rate fluctuations may create a need to charge different markets in the various markets. After having investigated the 7 price adjustment strategies, it is clear that their application depends on the specific situation the company is in. However, all of the price adjustment strategies can also do harm and damage if executed in the wrong way. Therefore, careful preparation, analysis and execution is an absolute prerequisite. Only then, the price adjustment strategies will lead to a short- and long-term increase in sales and continuous success.